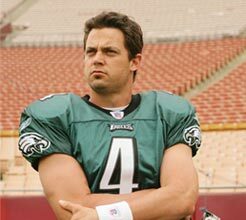 Kevin Kolb will be leaving Philadelphia, and no one will care! I would expect Kolb to be making his NFL exit very soon. Considering the Eagles is now carrying 4 QB’s, which include Donovan Mcnabb, Michael Vick and now Jeff Garcia. These 3 guys are light years above Kolb. So expect him to be cut and dropped off quick by Andy Reid at the Philadelphia Bus Stop…Maybe he could become a struggling bartender just trying to earn a buck, cause this NFL thing just isn’t going to workout. I mean really Philadelphia has giving this guy over 1000 chances to beat out Mcnabb. I never understood why the moronic fans in Philadelphia don’t love their Jesus, Donovan Mcnabb! Pick up some Cool Garcia Eagles Stuff on Ebay, for Cheap! !